Disinfectant towelettes designed for the hearing healthcare industry. These alcohol-free ultra fabric wipes are pre-moistened with a hospital grade disinfectant and are designed to clean and disinfect hearing aids, specula and headphones. Available in a 36 count or 160 count canister. Ideal for cleaning assistive listening devices, ear inserts, ear molds, heaphones, hearing aids and specula. 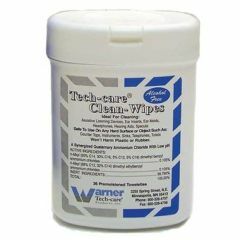 Safe to use on any hard surface or objects such as counter tops, instruments, sinkes, telephones and toilets. Won't harm plastic or rubber. Snap on cover VERY hard t. to open. The snap on cover is very difficult to open. I need to use something to pry it open. Use to clean Hearing Aids. The last one I had lasted almost a year. Wipes do dry out and it would be nice to know if directions could be provided on how to keep them fresh. Easy to use. Easy to use. Easy to use. Lightweight. Easy Storage. These wipes are great for cleaning my hearing aids. They are easy to use. They store neatly in a drawer. While some complained that the package was difficult to open, I have not found that to be the case. Seems to work well and there are a lot of wipes for the price. The wipes do not have a lot of liquid on them and may dry out over time.